Apart from a brief stint of Dr. Phil fandom, I’m not a big fan of self-help books. They usually strike me as saccharinely optimistic at best, and rigidly authoritarian at worst. This may explain why I was both intrigued and slightly turned off by Gretchen Rubin’s Better than Before. 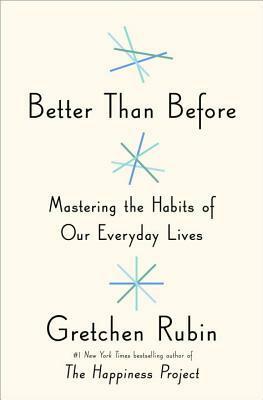 Rubin explores the idea of habit formation, and proposes that we all fall into one of Four Tendencies, depending on how we respond to obligation: Upholders stick to both external and internal obligations, Questioners do things only when it makes sense to them, Obligers need external accountability, and Rebels do what they feel like. According to Rubin, each of these tendencies can lead to success — the trick is to understand your own tendency and structure your habit formation along those lines. I admit bristling at these classifications when I first read about them, mostly because I realized I was a textbook Obliger. In North American society, today, where individuality and self-governance are so highly prized, it seemed to be that Upholders were the most suited to success, and being an Obliger was the surest path to failure. Ironically, just a few pages after I felt this, Rubin writes that of the four Tendencies, Obligers are the most likely to dislike their own tendency. Fortunately, as I read on, Rubin spoke at length about her sister — an Obliger — who is diabetic and who succeeded in getting her blood sugar down by changing her eating and exercise habits. For Rubin’s sister, it helped for her to tell co-workers that she no longer ate cupcakes, because they then helped hold her accountable to that resolution. Rubin also gives various examples of friends and family members with other Tendencies, who successfully formed new habits based on her techniques. Honestly, I think her friends and family were a lot more polite than I would have been, if someone offered to make me a “guinea pig” in their habit formation theory. Rubin claims to understand that what works for her (an Upholder) will not work for most other people (most people are either Questioners or Obligers), but apart from a nominal split second of reluctance, she seems to have no problem dictating habits that her friends and family should form. Still, it is gratifying to know that even Rebels and Questioners can be successful at forming habits. Also of interest are other classifications Rubin posits. One can be a Lark or an Owl (work best at daytime or at night), as well as an Abstainer or a Moderator (give up chocolate entirely or limit oneself to a square of chocolate a night). Again, alongside the Tendencies, these are useful in determining how to form new habits. For example, Rubin’s sister couldn’t commit to giving up all carbs to help her blood sugar, but she committed to abstaining completely from French fries, and that in itself has improved her health. Rubin also calls us out on relying on loopholes — e.g. the “tomorrow” loophole, where we plan to begin a new habit “tomorrow” and in the meantime, splurge for today. Or the “false choice” loophole, where we set up a false dichotomy between two competing values that may not necessarily be in opposition (e.g. I can’t exercise because I work so hard). I wish Rubin had spent more time talking about strategies for the other Tendencies, rather than relying on personal anecdotes sprinkled throughout. I also wish she had expanded the scope of the habits she chose to speak about — she mostly focused on habits she deemed important for herself, e.g. a low carb diet and exercising. Finally and most problematically, I thought that at times, she framed concepts and redefined terms in a way to suit her arguments. For example, she says we can’t use rewards to help us with our habits because then we’re doing things for the reward and not viewing the habit itself as a reward — this strategy may work for Upholders, but likely not for everyone. Worse, she then says we can have treats, as long as they’re not tied to a particular habit or seen as a reward — this strikes me as just semantics, and is disingenuous. For example, when someone suggests that Rubin give up her diet soda habit to be healthier, Rubin emphatically declares that diet soda is her treat, and because she doesn’t smoke and barely drinks, she is entitled to it. I couldn’t care less if she drinks diet soda or not, but her tone struck me as defensive, and makes me wonder why her drinking diet soda as a treat is justified whereas her sister eating carbs beyond French fries is given the side eye. Still, I thought the classification of Tendencies was useful, as were the details on loopholes and strategies we use that may hinder our habit formation. Rubin’s strategies for herself will definitely not work for me — she may thrill in structuring her days to such an extent, but I would chafe under such rigidity (e.g. scheduling a time each night for her and her husband to talk about their day) — but understanding that I’m an Obliger will definitely help me with my own habits. For example, it now makes sense why my whole strategy of going to the gym without a fixed schedule didn’t work for me — I enjoy the solitude of working out alone, but may need the accountability of a group class where people know me and would know if I skipped a class or two. Whatever your Tendency is, you can form a strategy for success, and Rubin’s book — particularly the first few chapters — can help you form that strategy. This entry was posted in Book Reviews and tagged 50BookPledge2015, ARC, Non Fiction, Random House Canada by Jaclyn. Bookmark the permalink. I think it’s always difficult reading about the ‘problems’ with our personality traits – sometimes it hits a bit too close to home!